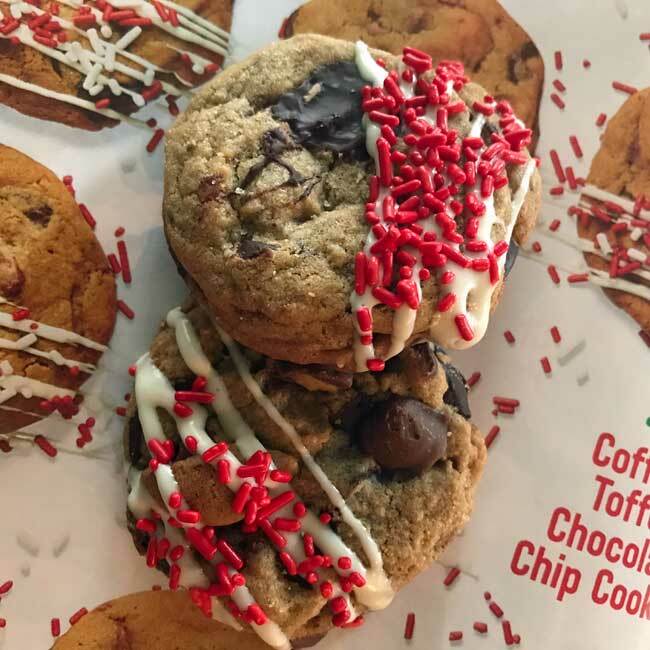 Of all the Christmas cookie recipes in the latest issue of Food Network Magazine, the one that caught my eye was the chocolate chip. 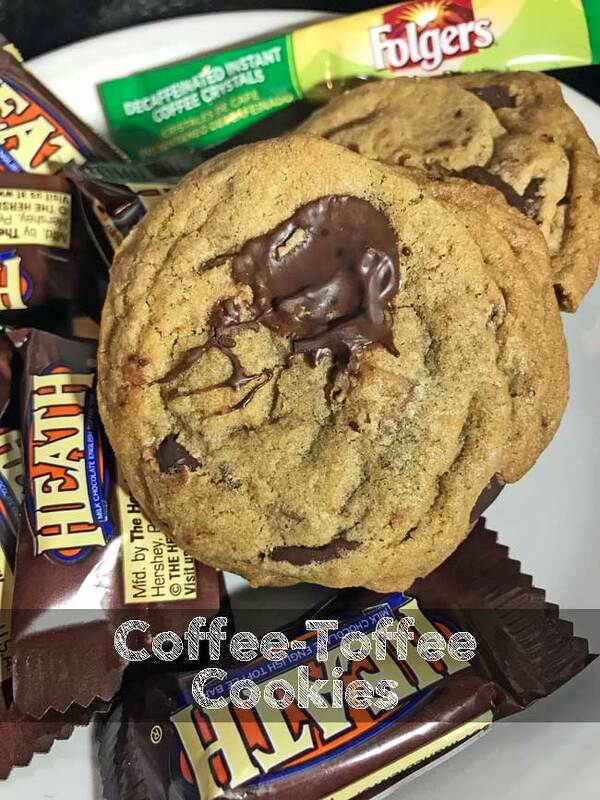 In this case, Coffee Toffee Chocolate Chip Cookies. The name Coffee Toffee (or Coffee-Toffee) isn’t new and there are lots of coffee and toffee combos. This is a good one! It’s kind of like the Neiman Marcus chocolate chip cookies, but with toffee and a little more butter. The recipe calls for espresso powder, but if you need to you can substitute regular or decaf instant coffee crystals. I’ve included the instructions on how to dissolve them in the notes. Having done so I think these would be better with instant espresso powder and plan on making another batch to compare. To make them more festive, you can do what Food TV did and garnish with melted white chips and red sprinkles. I put sprinkles on few of them but they taste better without. And speaking of “without”, you can also make them without the coffee. Leave it out completely and you’ll still have some very good Toffee Chocolate Chip Cookies. Coffee and Toffee liven up the flavor of these chocolate chip cookies. They are probably best made with instant espresso powder, but you can substitute instant crystals if you prefer. Or leave the coffee out entirely and you'll still have some good "brown sugar only" chocolate chip cookies. With an electric mixer, beat butter and brown sugar until creamy. Beat in espresso powder and vanilla. Add egg and beat until smooth. Mix together the flour, baking soda and salt, then add to the batter and stir until fully blended. Stir in chocolate chips and toffee. Using a medium size cookie scoop, scoop out about 22 cookies. Bake one sheet at a time for 8 to 10 minutes or until cookies appear set and lightly brown around the edges. To use instant coffee packets like the ones that come individually wrapped in a small box and cost about 99 cents, melt 2 tablespoons of the butter. Add 1 or 2 (if you like strong coffee flavor) packets of coffee crystals to hot butter and stir until is mostly dissolved. There may be still be some clumps, but they’ll dissolve once you start creaming the butter and sugar. Add the remaining 8 tablespoons of room temperature butter to the melted butter, then add the sugar, beat with the mixer and proceed with the recipe. Great tip, E! Thanks for sharing. Next time I’ll try that. When replacing espresso powder with instant coffee crystals, I’ve had good luck crushing the crystals to a powder in a mortar and pestle (takes about 10 seconds) then mixing the powder directly into the batter without dissolving. Maybe this little trick can help others who have difficulty finding instant espresso powder where they live, as I do. These cookies look amazing. Thanks for sharing the recipe! Sue, next time you get some toffee you should try these. I prefer them with toffee and without the coffee. I also noticed that unlike some chocolate chip cookies these still taste relatively fresh on Day 2. These seem like they would be delicious. I hear you regarding the sprinkles. They look nice but don’t taste awesome. I’m doing some therapy baking today. AKA stress relief baking. If I had the ingredients for these I’d probably just keep on baking. Lol.